UPDATED: Sat., Oct. 28, 2017, 5:39 p.m.
KEY WEST, Fla. – Things are weird, as usual, in Key West. A pair of Vikings push a stroller full of stuffed chimps down Duval Street. A man with a ponytail swallows a steel sword. People dressed only in body paint and glitter wander and jiggle from bar to bar. 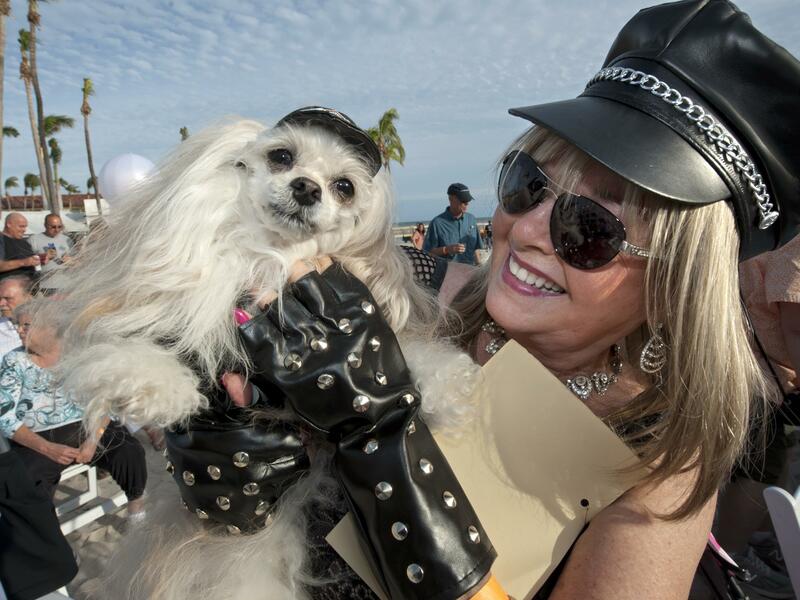 Fantasy Fest – one of Key West’s major tourist draws of the year – is in full swing. And that’s a relief for Florida Keys business owners trying to weather the economic storm that hit after Hurricane Irma battered the middle stretch of the tourism-dependent island chain. The festivities have not disappointed Gary Gates from Buffalo, New York, who planned this “bucket list” trip 10 months ago with six friends. Gates flew into Key West and has not left during its annual 10-day festival of costume parties and parades, so he has not seen the devastation that still lingers more than a month since Hurricane Irma made landfall Sept. 10 about 20 miles north of the city. The mostly residential middle stretch of the island chain took the brunt of the hurricane’s 130-mph winds. The area is still almost entirely brown, with debris piled alongside the highway and mangroves stripped bare. A stranded boat was christened the SS Irma with spray paint and offered “free” to drivers passing by. But at opposite ends of the 120-mile-long island chain, tourist attractions in Key Largo and Key West escaped significant damage. Dolphins Plus Bayside was ready for visitors three days after Irma’s landfall, but business has been down by half compared to last fall, said Mike Borguss, the third generation in his family to run the Key Largo attraction. Some staff now live with friends or in temporary trailers parked outside their damaged homes, but the dolphins swim up to the water’s edge to check out new people toting cameras, and an adjacent hotel property is open for weddings and other events that had to be canceled elsewhere in the Keys because of Irma, said Art Cooper, Borguss’ cousin and curator at Dolphins Plus Bayside. “The water’s pretty, the weather’s beautiful and we wish you were here,” Cooper said. Scott Saunders, president and CEO of Fury Water Adventures, estimated tourism in Key West has been about a third of what it was at this time last fall, even though the city’s hotels, restaurants, cruise ship operations and beaches quickly reopened after the storm. Jodi Weinhofer, president of the Lodging Association of the Florida Keys and Key West, blames news coverage of Irma – but not the hurricane itself – for the downturn. “There was over a $100 million worth of negative press,” Weinhofer said. Tourism is a $2.7 billion industry in the Keys, supporting 54 percent of all jobs in the island chain, according to Monroe County’s Tourist Development Council. Some jobs have been lost to Irma. Last week, Hawks Cay Resort on Duck Key, about 35 miles northeast of Irma’s landfall, let go 260 workers amid ongoing repairs. The Islamorada Resort Company said its four properties in the Middle Keys will be closed for renovations over the next six months. But up and down the island chain, bars, marinas and mom-and-pop establishments able to reopen have been hiring laid-off workers and keeping people from moving away, Daniel Samess, CEO of the Greater Marathon Chamber of Commerce. About 70 percent of roughly 35 hotels and motels in the Middle Keys are open, though those rooms mostly are filled by displaced residents and state and federal recovery workers. Officials plan to provide alternative housing and open those hotel rooms fully to tourists within the next two months, Samess said. Final sweeps for debris in some parts of the Keys are scheduled Sunday, which also is the finale for Fantasy Fest. So far, the amount of broken tree branches and remnants of homes and belongings wrecked by Irma could fill over 133 Goodyear Blimps, according to Monroe County officials. The cleanup will help create a good impression for visitors to Key West long before they arrive in the southernmost city in the continental U.S., said Key West Mayor Craig Cates. “It’s a scenic cruise in your car coming down, and it’s very important that they get it cleaned up,” he said. Published: Oct. 28, 2017, 12:08 p.m. Updated: Oct. 28, 2017, 5:39 p.m.